War hammer in hand, Hestea must struggle to find his place in a band of unlikely heroes. But first, he must cook breakfast. 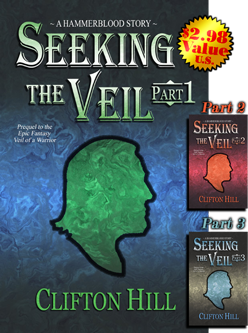 Sign up for the Newsletter and start your journey with a FREE copy of Seeking the Veil, Parts 1 - 3 (The Complete Story). Be first for News, more Free stories and the inside track. Welcome to the world of Hammerblood. *Story is in ePUB, Kindle & PDF Format. **Approx 250 pages in total. How do you read eBooks? Kindle (MOBI file)AppleNookKoboOther (ePub file)PDFNot StatedI only read paper books. Tell me what device you use so I can send you free stories.